The Women’s March Durango started at College Drive and Main Avenue on Saturday, walking up the northbound lanes to Buckley Park, where the crowd gathered and listened to speakers. 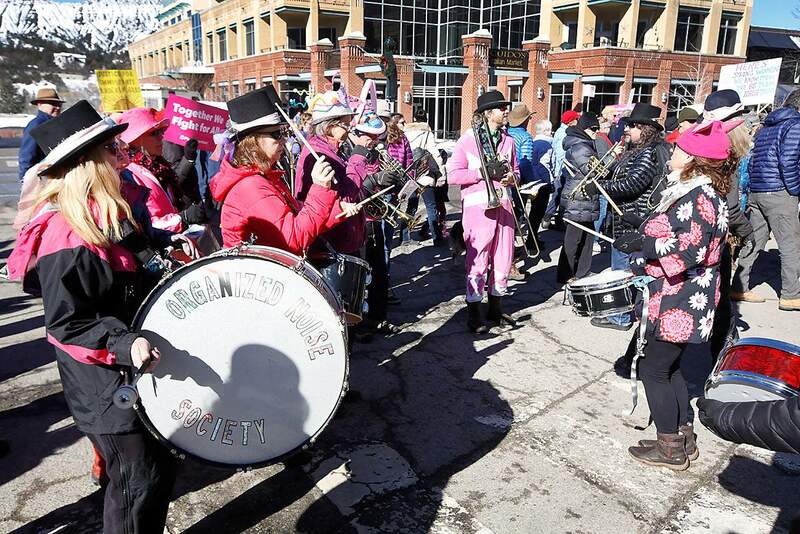 The Organized Noise Society band played on Saturday in the Women’s March Durango starting at College Drive and Main Avenue ending at Buckley Park. Allie Wolfe wanted to celebrate, and there’s good reason to: A record number of women have been elected to Congress. 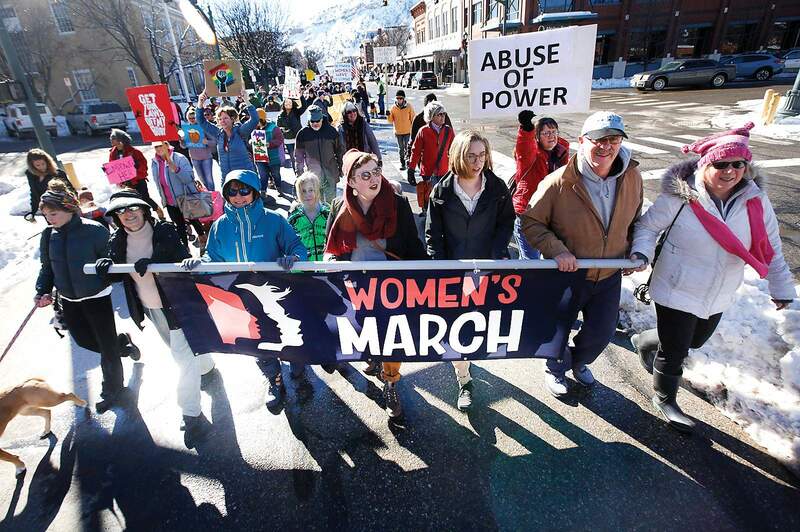 And while Saturday’s Women’s March Durango was a reminder of all the good that has happened in the past year, it is also an invitation to live out activism in everyday life, she said. About 500 people on foot were escorted by police up Main Avenue from College Drive to Buckley Park as part of a third annual, organized march and rally for women’s rights and against the Trump administration. Speakers at a rally held at Buckley Park talked about both topics, encouraging people in the audience to stand up for what they believe in and not be intimated by oppression. Along with Wolfe, other speakers included: Katie Young, Planned Parenthood community organizer; Ret. Navy Capt. Gail Harris; state Rep. Barbara McLachlan; and Katie Kandarian-Morris, minister at Unitarian Universalist Fellowship of Durango. Each argued against policies enacted by the Trump administration, drawing “boos” from the crowd, and acknowledged the accomplishments and problems women experienced in the past year. 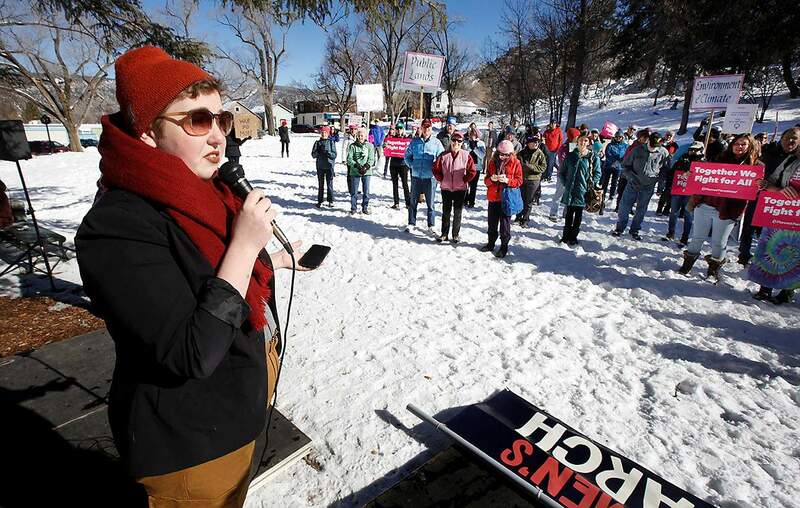 Allie Wolfe speaks to the Women’s March Durango crowd on Saturday at Buckley Park. About 100 people, some with signs and others wearing pink hats, gathered around Buckley Park to hear from each of the speakers. Susan Robison said she marched to show solidarity with everyone involved. It is important for voices to be heard, and there is no better way to ensure that than to get everyone speaking together, she said. “I hope to show our strength in whatever we feel strongly about as Americans, making the world better and turning things around because we’re going in the wrong direction,” Robison said. Maura Demko, executive director of Sexual Assault Services Organization in Durango, said she’s marching to support the womens movement. “Hopefully, it’s a time when we can all stand together,” Demko said. Emily Nelson marched in San Fransisco in 2017, when hundreds of thousands of people marched in response to Donald Trump’s presidency, and said that although Durango’s event is much smaller, she was excited to see the enthusiasm and diversity of the crowd. The Women’s March started as a worldwide protest after the inauguration of President Donald Trump, who was recognized by organizers of the group as anti-woman. The Women’s March in 2017 was the largest single-day protest in U.S. history. “I don’t have any grand views that this will change everything, but it’s inspirational to know people care about a lot of the same things as we do,” Nelson said. Louise van Vonno said she’s hoping to bring awareness to women’s issues as a marcher. Times have changed, she said, and the world needs to recognize that the same opportunities that exist for men don’t exist for women. “I want it to be different,” she said. Thomas Heuser marched with his family to support women’s rights and equal rights around the world. Events like this show that there is more that connects us than divides us, he said. “I think we all hope to raise awareness of inequalities that may not be part of everyone’s lives,” he said. Women's March Durango Hundreds took part in the Women's March Durango on Saturday as they marched from College Drive up Main Avenue to Buckley Park. Hundreds took part in the Women's March Durango on Saturday as they marched from College Drive up Main Avenue to Buckley Park.